tags: bad food photography, crusty hot breads, garlic butter, vintage recipe cards, WTF does Men's Favorites mean? Cut bread diagonally into 1-inch slices. Mix remaining ingredients; spread on slices. 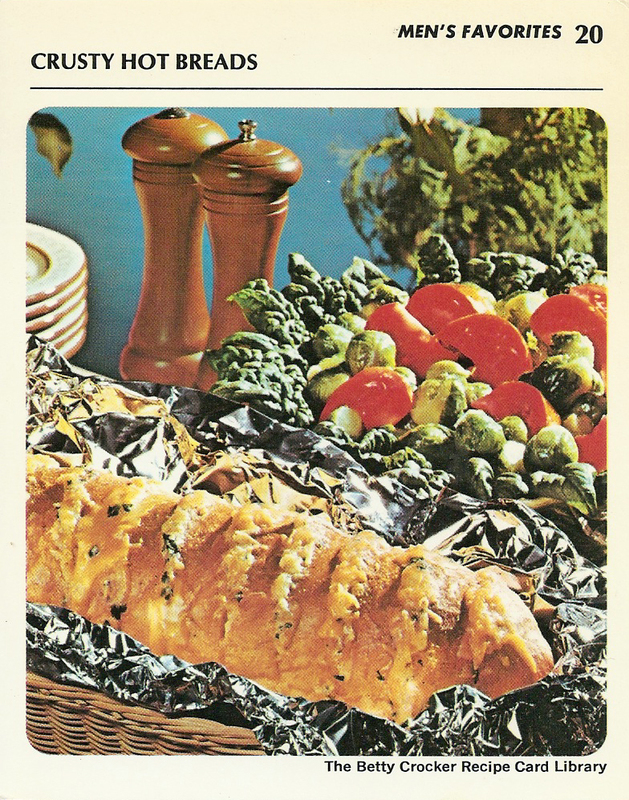 Reassemble loaf; wrap securely in 28 x 18-inch piece of heavy-duty aluminium foil. Place on grill 4 inches from medium coals. Heat loaf 15 to 20 minutes, turning once. Cut 1 pound loaf French bread into 1-inch slices or 1-pound loaf Vienna bread into 1/2 inch slices or split 8 large individual club rolls. Spread generously with one of the Butter Spreads (below). Reassemble loaf or rolls; wrap securely in 28 x 18-inch piece of heavy-duty aluminium foil. Place on grill 4 inches from medium coals. Heat loaf 15 to 20 minutes, rolls 10 to 12 minutes, turning once. Makes 24 to 28 slices or 8 rolls. Who knew Betty Crocker was sexist? Men’s favorites? Seriously? That Hickory loaf is really good, I used to make it. Go light on the hickory salt though.